We’d love your help. Let us know what’s wrong with this preview of Without Hesitation by Talia Jager. Without Hesitation is set a thousand years in the future. Earth has become a wasteland. Humans traveled into space to colonize other suitable planets. Labels and stereotypes are a thing of the past and gender and sexual identity are as fluid as love as humans strive to survive. Here we meet Everleigh, the commander of her ship named Nirvana. She is under the control of an Without Hesitation is set a thousand years in the future. Earth has become a wasteland. Humans traveled into space to colonize other suitable planets. Labels and stereotypes are a thing of the past and gender and sexual identity are as fluid as love as humans strive to survive. Here we meet Everleigh, the commander of her ship named Nirvana. She is under the control of an evil madman, Caspar, who keeps her family captive. He sends her to Valinor to abduct the Empress Akacia. When she arrives, she is taken back by Akacia’s beauty and when the Empress fights back, Everleigh realizes she has met her match. To ask other readers questions about Without Hesitation, please sign up. I really wanted to love this book. It had so much potential, but I have to give it a 3.5 rounded up. There was insta-love, of which I’m not a fan. And the world building was flimsy. I’m still going to try the next book, so we’ll see! Perhaps I had the wrong impression going in but my thoughts on the book. I thought this book was going to be a swashbuckling story of a space pirate girl battling through the universe with some romance mixed in. What I got was a love at first sight story with sci fi randomly tossed in to make it seem grandiose but for me caused it to fall flat. Empress of a very desirable world but doesn't have ships protecting the planet so a lone ship can threaten it? Same ships transverse the universe in days, they have beam technology that can go long distances, but nanotechnology is cutting edge research? Hundreds of worlds have gathered an alliance together and during a meeting two ships manage to kill off all the leaderships? Decent book, I am interested in a sequel. I've just finished reading the book and I enjoyed it, in fact it was hard to put down because I thought the plot and characters were interesting and believable. I don't mind love at first sight stories, actually, it's enjoyable to read a book about two young women falling in love without teenage angst. The conflict between Everleigh and Akacia was, as weird as it sounds, quite refreshing to read and I thought especially Akacia's reactions and feelings were understandable. I must say, however, tha I've just finished reading the book and I enjoyed it, in fact it was hard to put down because I thought the plot and characters were interesting and believable. I don't mind love at first sight stories, actually, it's enjoyable to read a book about two young women falling in love without teenage angst. The conflict between Everleigh and Akacia was, as weird as it sounds, quite refreshing to read and I thought especially Akacia's reactions and feelings were understandable. I must say, however, that I was a little dissatisfied with the writing style. I was craving more descriptions, letting me be immersed in the world and feelings of the characters, but instead it was mostly just stringing together events and actions. Don't be afraid to describe the characters surroundings and how they make them feel. Make them take in the landscape, the smells, the sounds. It makes it easier for the reader to put themself in the shoes of the protagonists. I received this book for free through Voracious Readers Only. 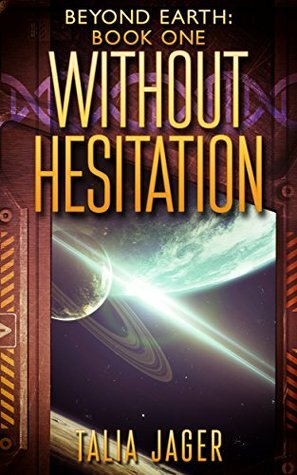 Without Hesitation is a fast paced science fiction adventure. Everleigh and her faithful crew are 'employed' by Caspar, who threatens to kill their families if they don't follow orders. When she is ordered to kidnap Empress Akacia of Valinar, and ends up falling in love with her, they decide to defy Caspar for the first time. After a rush of action, torture, a spaceship crash and surviving on a hostile planet, they have to get rid of Ca I received this book for free through Voracious Readers Only. Everleigh and her faithful crew are 'employed' by Caspar, who threatens to kill their families if they don't follow orders. When she is ordered to kidnap Empress Akacia of Valinar, and ends up falling in love with her, they decide to defy Caspar for the first time. After a rush of action, torture, a spaceship crash and surviving on a hostile planet, they have to get rid of Caspar to save Everleigh's and her crew's families. I really liked the story, at times it felt almost like a dark fairy tale (view spoiler)[with the Splicers; humans who have been enhanced with the DNA from different animals (hide spoiler)]. It was well written and kept me guessing until the final pages. Everleigh is commander of her own ship. Everleigh and the crew of Nirvana are criminals and work for a man named Caspar who is a very evil man. Everleigh and her crew want nothing to do with Caspar but he is holding their families hostage so under the circumstance they have no choice if they want to ever see their families alive again. Caspar sends Everleigh on a mission to capture Empress Akacia on the planet Valinor. After the Empress is captured and taken aboard the Nirvana Everleigh is smitt Everleigh is commander of her own ship. Everleigh and the crew of Nirvana are criminals and work for a man named Caspar who is a very evil man. Everleigh and her crew want nothing to do with Caspar but he is holding their families hostage so under the circumstance they have no choice if they want to ever see their families alive again. Caspar sends Everleigh on a mission to capture Empress Akacia on the planet Valinor. After the Empress is captured and taken aboard the Nirvana Everleigh is smitten with her and has a change of heart. She never wanted to take the Empress in the first place but Caspar has her family. So after she spends time with Akacia and falls for her, Everleigh knows she cannot turn the Akacia over to Caspar. Everleigh and Akacia team up together to find a way to stop Caspar and save their families but first they must find out where Caspar is holding them. Without Hesitation is a very enjoyable read that pulled me in from the very beginning and kept me hooked right through the whole ride. I really enjoyed following Everleigh and her crew as they flew and jumped from one planet to another. I loved the world that the author created for Without Hesitation and can’t wait to read more about this world and the characters in the next book Painted Skies. An enticing introduction to a sci-fi series with two female protagonists. While tension starts as a fight between the two there exists a mutual attraction which intensifies through incidents which sometimes are not what they seem. It was exciting to read and though I'd like to write more but I'm afraid I would give too much away. I thought this was a pretty good read with a unique premise. I really enjoyed the characters and their relationships with each other were very believable and emotional. I hope 5he next book ends on a happier note.